'That Cackling Conundrum' by Michael O'Keeffe. Canada and Cackling Goose Complex (Layout & Design: Michael O`Keeffe). 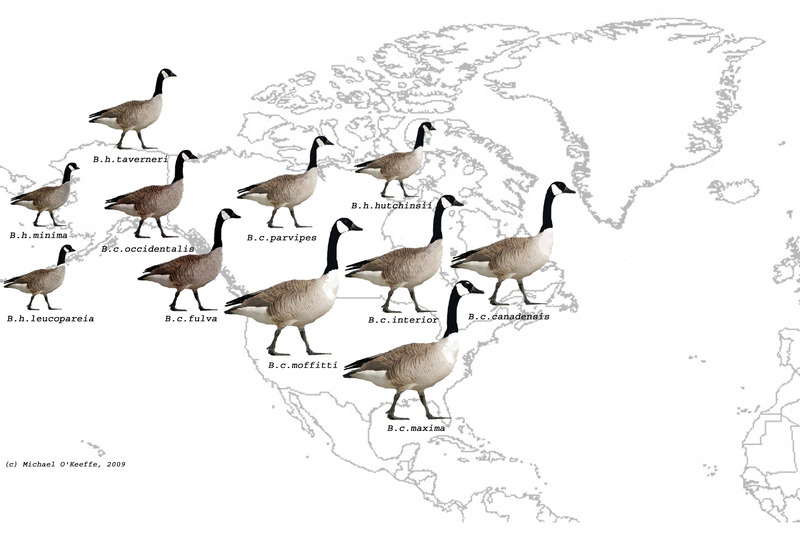 The diagram above is my artist's impression of the 11 taxa of Canada and Cackling Geese based on various general descriptions and photographs presented on the web and in print. Given the degree of inter and intra-specific variation that is reported to exist and given the still relative lack of solid criteria for identification, this diagram really serves little purpose other than to illustrate the general trend towards larger birds to the south, smaller birds to the north and darker birds to the north west. While such simple parameters may actually serve as useful indicators for North American birders sorting through flocks of geese for that lone vagrant, it is of absolutely no use to us over here in Europe! In fact the decision of the AOU to split Cackling and Canada Geese represents a major identification challenge (some would say a nightmare) for birders both in North America and in Europe. The main stumbling block for birders and rarities panels alike is that there is little agreement of yet as to the definitive criteria for firmly identifying any of these forms. Put simply, for European birders the puzzle is split into three. If one encounters a large Canada Goose it is either from European feral stock or it could be a wild bird from Southern Canada or the United States. There are some criteria proposed for separating wild interior (already conclusively recorded in Ireland) from our own feral birds but given that some feral birds overlap in general appearance with some interior, properly identifying and also verifying the origin of a large Canada Geese remains problematic. A small goose (White-fronted Goose sized or smaller) is unlikely to come from a local feral population as most Irish and British Canada Geese resemble the nominate canadensis both in size and overall appearance. However some small forms do exist in captivity so the question is not as "cut-and-dried" as "if it is small surely it must be wild?" Some small "White-cheeked Geese" are likely vagrants to Europe, particularly the eastern-most form of Cackling Goose, hutchinsii (one recently accepted by NIBARC). At the heart of the debate is the form tavernerii which was formerly paired with parvipes - together formerly referred to as "Lesser Canada Goose". The trio of hutchinsii, tavernerii and parvipes is therefore largely where that Cackling conundrum lies. Finding the means to definitively separate parvipes from its Cackling neighbours it seems is the first task to be overcome. hutchinsii appears to be quite a distinctive form and may indeed be readily separable from most parvipes given good views. Many tavernerii on the other hand it seems may be indistinguishable from parvipes. Martin Garner (2008) by delving into the monumental work of Harold Hanson (2006, 2007) has taken the debate down a new avenue with some interesting conclusions for hutchinsii 'that don't quite fit' as well as possible alternative explanations for tavernerii claims from Europe. While birders across the northern hemisphere are attempting to unravel this grand enigma anyone prepared to take up the challenge of identifying a vagrant Canada or Cackling Goose in Ireland is advised to take copious notes and photographs, concentrating on all aspects of the bird's size, structure, plumage patterns and colouration. Anyone unprepared for patient study may find it difficult getting their record past a rarity assessment panel. Unfortunately, even with the best notes and photos in the world it is likely some if not many birds will remain unassigned for some time to come. From here I recommend you visit David Sibley's website. There are also lots of other interesting links provided in the list of references and useful reading below. Abraham, K. 2005. Cackling Goose, not new to Ontario [online]. Available from: http://www.ofo.ca/reportsandarticles/cacklinggoose.php [Accessed September 2009]. Banks, R. C., Cicero, C., Dunn, J.L., Kratter, A.W., Rasmussen, P.C., Remsen, J.V., Rising, J.D. & Stotz, D.F. 2004. Forty-fifth supplement to the American Ornithologists' Union Check-list of North American Birds. Auk 121: 985-995. Batty, C. & Lowe, T. 2001. Vagrant Canada Geese in Britain and Ireland. Birding World 14(2): 57-61. Deviche, P. & Moore, M. 2005. Arizona White-cheeked Geese: The Canada vs. Cackling Goose Challenge [online]. Available from: http://azfo.org/gallery/challenges/WhiteCheekedGeese.html [Accessed September 2009]. Garner, M. & Friends. 2008. Frontiers in Birding. Bird Guides Ltd., Sheffield. Hanson, H.C. 2006. The White-cheeked Geese: Taxonomy, Ecophysiographic Relationships, Biogeography, and Evolutionary Considerations. Vol 1 Eastern Taxa. Avaar Books, California USA. Hanson, H.C. 2007. The White-cheeked Geese: Taxonomy, Ecophysiographic Relationships, Biogeography, and Evolutionary Considerations. Vol 2 Western Taxa. Avaar Books, California USA. Hertzel, P., Silcock, W.R. & Dinsmore S.J. 2005. Identification of Canada and Cackling Geese in Iowa [online]. Available from: http://www.iowabirds.org/Birds/ID/CacklingGeese.aspx [Accessed February 2012]. Krueger, H. 2005. Cackling Goose -- Canada Goose Subspecies Identification Indicators Introduction [online]. Available from: http://www.idahobirds.net/identification/white-cheeked/introduction.html [Accessed September 2009]. MacDonald, T. Canada Goose Subspecies [online]. Available from: http://www.camacdonald.com/birding/Canadagoosesubspecies.html [Accessed September 2009]. Roberson, D. 2009. Identification of Canada and Cackling Goose in Monterey [online]. Available from: http://johnrakestraw.net/2009/02/21/lesser-canada-goose/ [Accessed September 2009]. Sibley, D.A. 2000. National Audubon Society The Sibley Guide to Birds. Chanticleer Press, NY. Sibley, D.A. 2004. 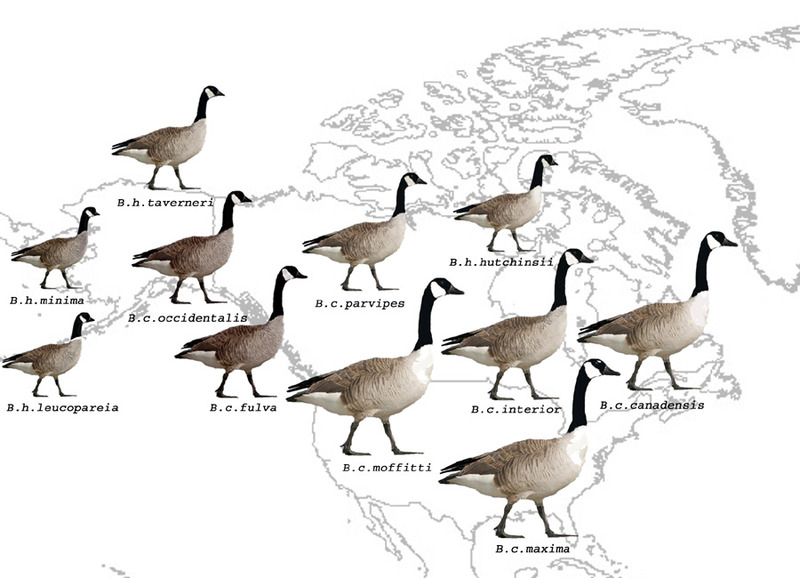 Identification of Canada and Cackling Goose [online]. Available from: http://www.sibleyguides.com/2007/07/identification-of-cackling-and-canada-goose/ [Accessed February 2012]. Stackhouse, M. 2004. The New Goose [online]. Available from: http://www.utahbirds.org/RecCom/NewGoose.htm [Accessed September 2009]. Steele, J. & Scott, M. 1997. Identification (Canadian club). Birdwatch 55: 34-38. Wilson, A. 2003. Identification and Range of Canada Goose (Branta canadensis) Subspecies [online]. Available from: http://www.oceanwanderers.com/CAGO.Subspecies.html [Accessed September 2009]. In 2004 the American Ornithological Union (AOU) split Canada Goose into two full species, i.e. Canada Goose (Branta canadensis) and Cackling Goose (B. hutchinsii) as did the British Ornithologists' Union (BOU) in 2005. In 2009 the IRBC adopted the split following the publication of the 2007 Irish Rare Bird Report which included the first record of a small form of Canada Goose in Ireland. Click HERE to open a full size image of the map diagram.